Looking through the history of Western culture, has there ever, I wonder, been a decade quite as rich in achievement as the first ten years of the 17th century? Shakespeare was, in this decade, at his very peak. Exact dating is difficult, but it appears that by 1601, the start of the decade, Shakespeare already had behind him Hamlet and Twelfth Night. What followed was every bit as remarkable – Othello, King Lear, Macbeth, Antony and Cleopatra. In comparison with works of such order, even plays such as Measure for Measure, Troilus and Cressida or Coriolanus – works that would be considered towering works of genius from any other writer – are often, in this context, regarded as “relatively minor”. By the time the decade ended, Shakespeare was engaged on his final trio of dramatic masterpieces – Cymbeline, The Winter’s Tale and The Tempest. And amongst all this was the publication in 1609 of one hundred and fifty four sonnets – works that ensured that even if Shakespeare had never written a single play, we’d still be thinking of him as our greatest writer. And also in this decade, over in Spain, Cervantes published the first of the two parts that make up Don Quixote, and began work on the second. If, as is said – I can’t remember by whom: indeed, I think I just made it up – that the four principal pillars of Western literature are Homer, Dante, Shakespeare and Cervantes, it is surely remarkable that two of them were at their peak at the same time. There was other fine writing as well – the Jacobean era was, after all, the most glorious period of English drama; and inSpain, there was the prolific Lope de Vega. It is an indication of the sheer stature of Shakespeare and Cervantes that literature even of this quality seems to be in their shadow. Other areas of the arts were flourishing as well. 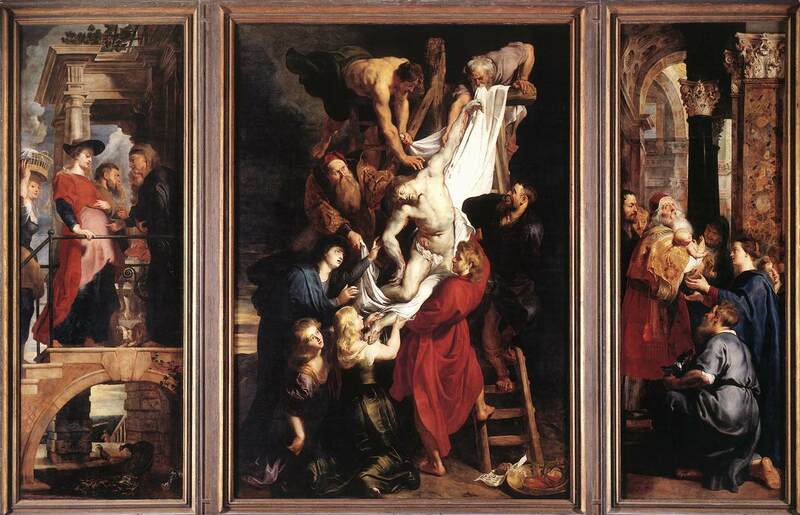 The young Rubens was already well-established, and in the final years of this decade, was engaged on those two massive works now in Antwerp Cathedral – The Raising of the Cross, and the almost unbearably moving Descent from the Cross, in which the body of Christ seems to be falling and soaring at the same time. 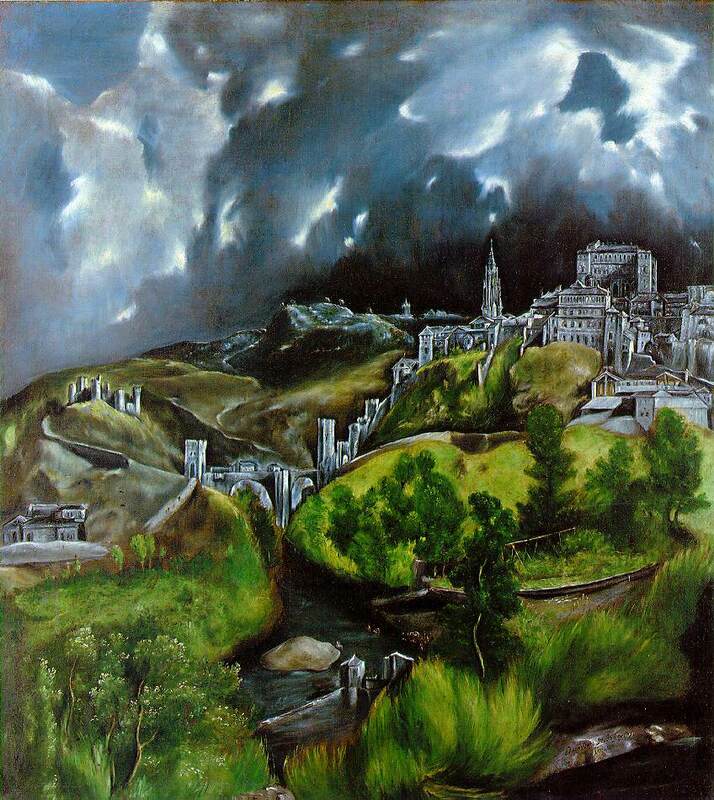 Meanwhile, inSpain, El Greco was putting on to canvas his very personal and idiosyncratic mystical visions. Equally idiosyncratic and personal were the late paintings of Caravaggio: having killed a man in 1606, Caravaggio spent the last few years of his brief life on the run, and found himself in Naples, Sicily, Malta, unable to settle anywhere for long. Before his untimely and mysterious death, his strange and violent death-haunted imagination put on canvas some of the most intensely tragic and powerful of visions. Meanwhile, if we turn to music, Monteverdi composed Orfeo, among the earliest and greatest of all operas, and, in 1610, the monumental Vespers. In England, William Byrd was composing at the height of his powers: his two books of Gradualia were published within these years. Science was not left behind in this either. Just before the start of this decade, in 1610, William Gilbert published his astonishing discovery that the earth itself was a huge magnet; and the decade ended with Galileo observing with his new-fangled telescope the moons of Jupiter, and the phases of Venus. In between, Johannes Kepler formulated and published his ground-breaking Laws of Planetary Motion. It seems unimaginable that all this could happen within the space of just a few years. Suddenly, the world seemed to cast off its old clothes, and enter a new phase. Was there something in the air? One tries to find connections between all these achievements, even though one knows that such connections are, at best, fanciful. Shakespeare and Jonson knew each other, and, one imagines, they would have known the other dramatists and poets in London at the time; but mostly, all these great men of genius were working independently. But fanciful or not, it’s hard not to see some of Shakespeare’s tragic spirit in those late paintings of Caravaggio. And, although the sun-baked plains of La Mancha are as far as can be imagined from the deep claustrophobic gloom of Glamis Castle, one can imagine Don Quixote agreeing with Macbeth that “Nothing is but what is not”. painting Toledo during an apocalyptic storm. (Dating of this painting varies: some date it to the late 1590s rather than to the 1600s, but let’s not allow such little details to get in the way!) Storms of such elemental violence could, no doubt, occur inEngland as well: every time I read those storm scenes of Shakespeare’s play, I find it difficult to banish from my mind El Greco’s tempestuous vision. still a living, sentient being. 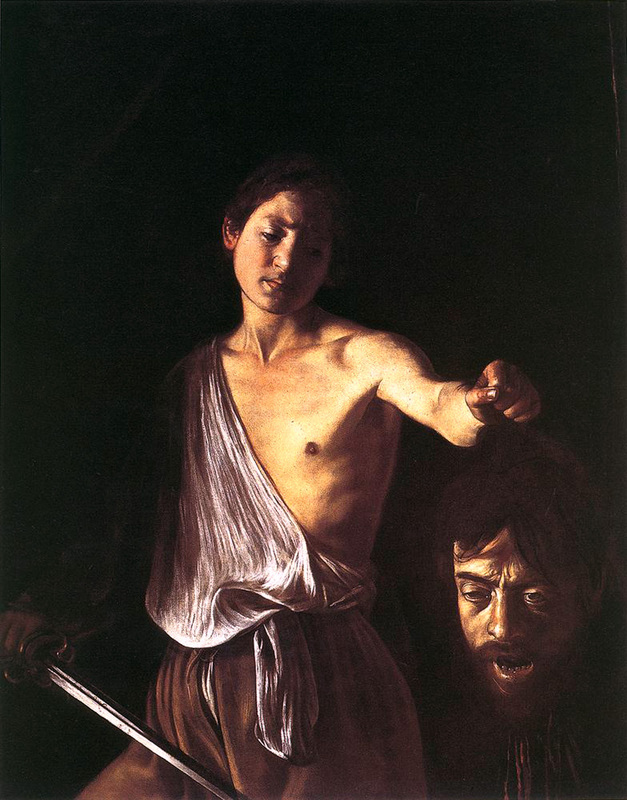 This decapitated head is Caravaggio’s self-portrait: here, he pictures himself conquered by a mere boy. (“To the boy Caesar send this grizzled head…”) And, though defeated, though decapitated, I can almost hear Caravaggio agreeing with Shakespeare’s Cleopatra, that “’tis paltry to be Caesar”. But of course, this is all mere fancy. The air of that decade was nothing special: it wasn’t so different from the air we breathe now. But when I think back on what was achieved in those few years, and I cannot help but be struck with wonder. It’s almost as if all the finest aspects of human genius were concentrated into that brief space of time.